Amy Lennox doesn’t know quite what to expect when she and her mother pick up and leave Germany for Scotland, heading to her mother’s childhood home of Lennox House on the island of Stormsay. Amy’s grandmother, Lady Mairead, insists that Amy must read while she resides at Lennox House—but not in the usual way. It turns out that Amy is a book jumper, able to leap into a story and interact with the world inside. As thrilling as Amy’s new power is, it also brings danger: someone is stealing from the books she visits, and that person may be after her life. Teaming up with fellow book jumper Will, Amy vows to get to the bottom of the thefts—at whatever cost. This book wasn’t quite what I expected. Told from the perspective of Amy Lennox, a girl whose family has the ability to jump into books, I was hoping this would be a much better read. But before I get into what was bad, let me quickly tell you what I enjoyed about The Book Jumper. I found the story itself to be interesting. Even though I’ve read a book similar to this one (Inkheart), I find the idea of being able to immerse yourself into your favorite stories and meet some of your favorite characters to be very exciting. As someone who hopes to one day publish a story of my own, books like this remind me why I love reading and writing so much. They bring out the love in storytelling for me and make me interested in reading books I haven’t enjoyed in a really long time. I also liked the characters. Despite any of them having any sort of development, I found the characters to be relatable. I also loved finding out how they were connected to each other in Stormsay. Each of the characters had an important role to play and it was interesting to see how everything turned out in the end. I liked getting to meet some of the literary characters because it was nice to see how they interacted with each other. One of my favorite aspects of this book was seeing Amy’s ability in action. I was curious about how the author was going to incorporate book jumping into the story and wasn’t disappointed. It was interesting to see that book jumping had zero affect of the original plot of the books unless jumpers themselves decided to interfere with the story. I also like the book cover and the little paragraphs before each chapter. It looks really beautiful, like the story came out of a fairy tale. I found the little paragraphs before each chapter to be very captivating. After reading this story, you understand their purpose and see how they connect to the overall plot. Sad to say but there were so many things with this book that made it hard to enjoy it as much as I’d have liked. I found the writing to be too dense, almost as if the author was trying to pack everything in at once. And it showed. The reader can see it in the story when it comes to the plot. It’s all rushed, like the author had no time to continue writing this story. There’s also a lack of character development and morals in this book that bothers me. I find that even though the characters can be relatable, they don’t really learn from what happens in this story. They don’t change or progress in any way that shows that what happened in the story affected their lives. The only exception to this is Amy since she didn’t know about her abilities until she and Alexis came to Stormsay. 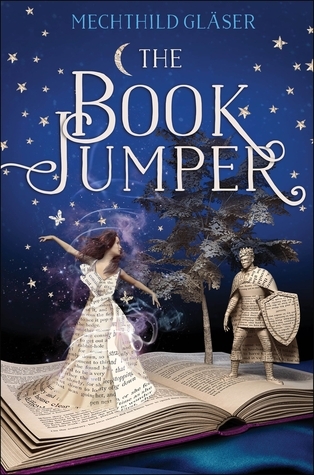 What also bothers me with The Book Jumper is the way protecting the stories is portrayed. Throughout the book, Amy again and again is telling everyone that something is going on in the literary world. But nobody believes her or listens to her, except for Will. Instead, they get mad she’s using her abilities to go to other literary world’s when she’s been assigned to watch over one of them. Even when a literary character loses their life in the real world, nobody bats an eye. They continue moving on as if nothing happened. In many ways, it’s as if the events in this book happened in a small vacuum because nobody else in the real world is affected by the outcome. Even though I enjoyed reading The Book Jumper, I’m sad because it’s not as good as it could be. It had so much potential, but the author didn’t manage to pull it off.